I remember the first day I saw the pattern for the Beekeeper’s Quilt by tiny owl knits up on Ravelry. I thought, that’s the craziest, most beautiful thing I’ve ever seen. I have to have it! Of course, being relatively new to knitting, I still have strong hesitations to buying patterns while there are so many free ones out there. This week, though, I gave in and got it. I realize I’m probably the last knitter on the planet to get on board with this craze. 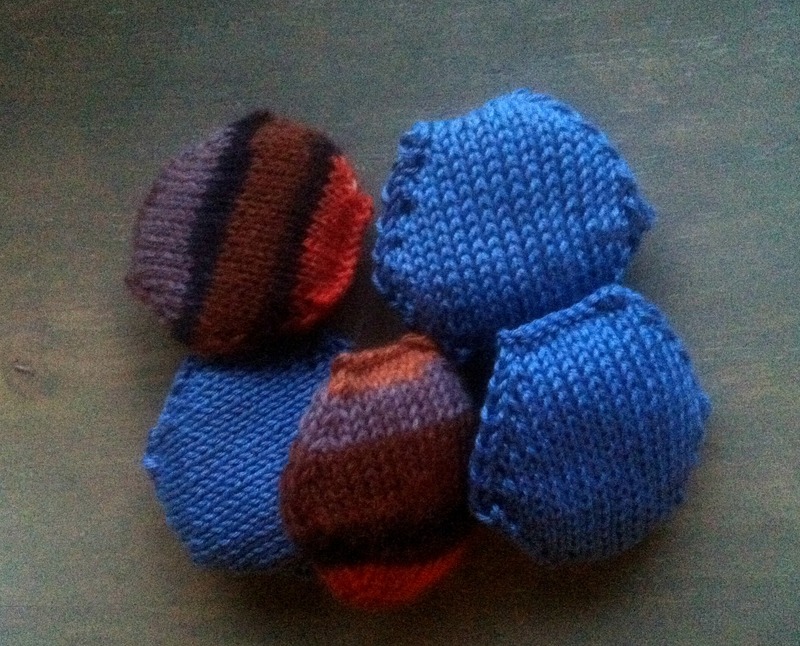 I’ve been spotting tiny hexipuffs all over the Internet and blog world. Everyone seems to be working steadily away on this pattern, including me now. I think I decided to go with this pattern in the end because it was a great way to use up the leftover yarn bits from the 52 Socks Project for 2012. Each puff takes, I’m guessing, 15-20 yards? No more than 20, really. I’ve read they take about 25 minutes to knit up; for me, it’s more like 40-45, but that’s still not bad. Over the past couple of days, minus Wednesday when I was too sick to bother with anything, I’ve knit up 5 puffs. That used up the blue cotton I used on my first toe-up socks and a bit of the Patons stripe sock yarn from my husband’s socks. This morning I cast on again, this time using crochet thread, which was a similar thickness as the blue socks and also cotton. 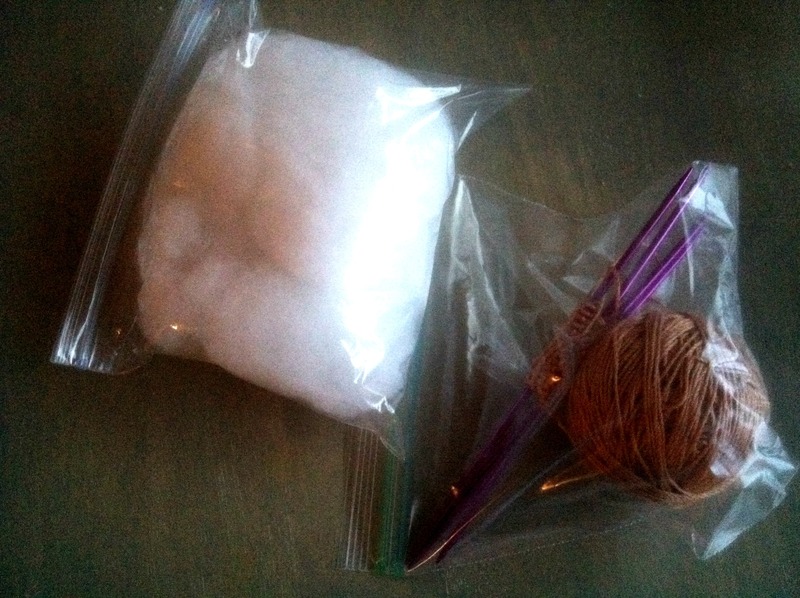 Luckily, I also found a huge bag of filling in my craft box, so this may end up being the ultimate stash bust project in the end. I have no idea how many I want to knit; I might start my aim at 500. Ideally, I’d like a 4×5 blanket, but I know that’s going to take a really long time. I may just have this be my joint 2012 project, along with the socks, and see how many I get in the end. In other news, Valentine’s Day was this week! Did you know? I’m not really a big V-Day kind of gal, and my husband works nights, so there wasn’t much to report. He did scare me half to death showing up at about 7 pm, rather than his usual 11:30 pm, to hang out. I think we watched Torchwood and I knit (I’m a geek!). I only bring it up because my Valentine’s Day present arrived last night! I’m really quite excited and nervous about it. 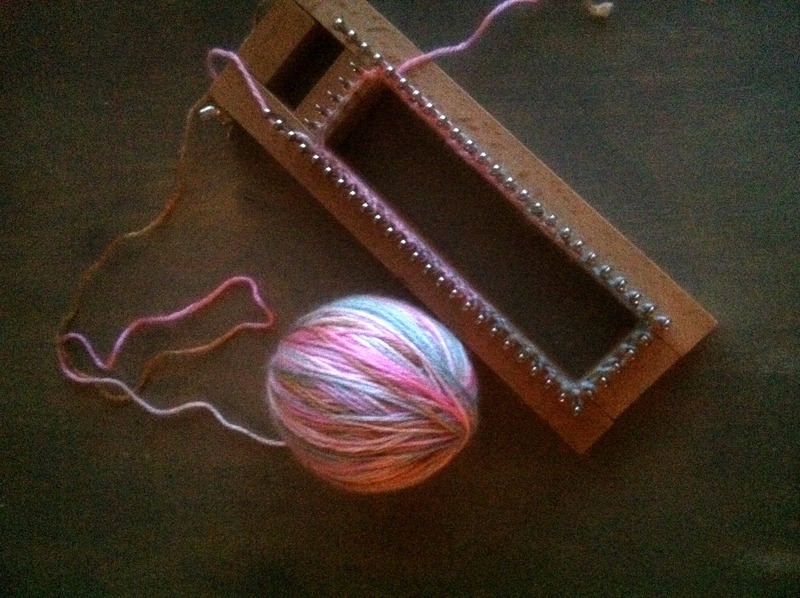 My dear husband bought me a sock loom in hopes of helping me reach my 52 sock goal. I started working with it last night, but I think I cast-on too tightly. The yarn was too hard to work with, and I ended up putting the new toy down to work on hexipuffs instead. I’ll probably give it another go this weekend.